1. Who are the presiding deities of shradh ? Pururav-Ardrav and Dhurilochan are Vishvedev (Group of Deities) of pitars. They are mentioned in the shradh rites. Shradh is associated with the presiding Deities Vasu, Rudra and Aditya of the pitars. The mantras recited and the rites performed during shradh helps establish contact with these Deities. The deceased individual to whom the shradh rites are being addressed is counted among the followers of Vasu, his parents are counted among the followers of Rudra and his grand-parents are counted among the followers of Aditya. Therefore, during shradh, the names of the father, grandfather and great-grandfather (or mother, grandmother and great-grandmother) are pronounced as representatives of Vasu, Rudra and Aditya respectively. 2. Is it acceptable to prepare favourite dishes of the deceased in the shradh meal ? If the favourite dish of the deceased is among the prohibited food items, then it should not be included in the shradh menu. In contrast, if the favourite dish of the deceased is among the ideal food items, it should certainly be prepared. 3. During the meals served to the Brahman during shradh, if the pitar-Brahman asks for a particular food item, should it be served ? During the meal in the shradh, a prayer is made unto the Brahmans – ‘Of the food items which have been prepared, partake of whatever you wish’. In other words, if the Brahman asks for food items other than those served, there is no need to oblige. 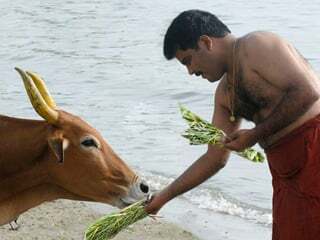 So also, as per the scriptures, since the Brahmans are supposed to eat in silence, there is no question of their asking for some other food item. 4. How does the food offered to pitars (Ancestors) reach them ? A question posed in the Matsyapurana pertaining to shradh – How does the food consumed by the Brahmans or offered in the fire sacrifice reach the deceased souls after death, since they take rebirth and assume a new body ? The answer to this question is also given there. 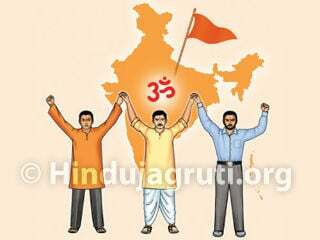 It reaches them through the Deities of pitars (namely, Vasu, Rudra and Aditya) or the food is transformed into other items such as Divine nectar, grass, pleasures, air, etc. and reach the pitars in different species. The mystery behind the food and pinda of the shradh reaching the pitars through the medium of Brahmans during shradh lies in “चरोः प्राणभक्षं भक्षस्व ।”. 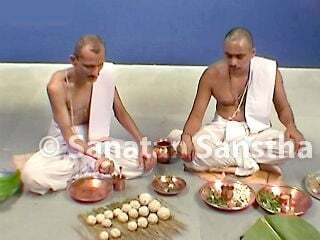 It means, the pitars need to extract a portion of Pranashakti (Vital energy) from the pinda. Here, one needs to recollect how an elephant consumes a wood-apple and excretes it as it is. The mystery is in the process the kernel within the fruit iscompletely consumed. If this is possible, why is extraction of Pranashakti by the pitars from the pinda surprising ? Since the Deities and pitars exist at the subtle-plane (and are not gross), they do not consume the food offered to them, they only imbibe the fragrance from it. 5. How long does the food offered to pitars through the shradh suffice ? 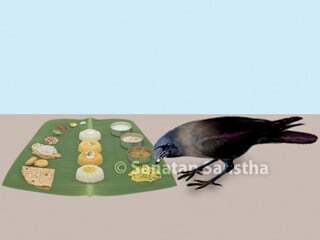 The food offered in one Mahalaya shradh lasts till the subsequent Mahalaya shradh, that is, for one year. 6. What is done if for some reason it is not possible to prepare the shradh meal ? At such times, Ama shradh should be performed. ‘Ama’ in Sanskrut means uncooked food. A shradh performed using uncooked food is Ama shradh. Meaning : Perform Ama shradh when there are financial difficulties, a Brahman invitee is not available, during travel, upon the birth of a son and if the wife has her menstrual period. He who has the right to perform a Parvana shradh alone has the right to perform Ama shradh. 7. How is a shradh ceremony performed during the shradhsampat (when more than one shradh falls on the same tithi) ? If there is shradhsampat of the parents, first perform shradh of the father and then by cooking afresh, perform shradh of the mother. 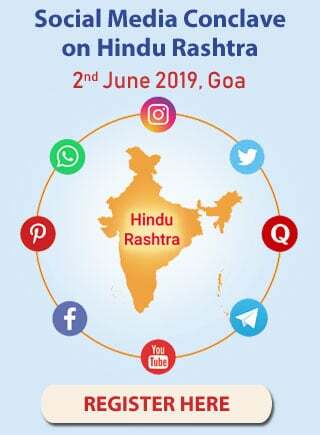 If there is shradhsampat of those who are sapinda (Belonging to the same lineage), the shradh should be performed serially in the order of decreasing closeness, with different food cooked for each pitar. If cooking separately is not possible, cook together; but, the shradh should be performed separately. If shradhsampat is due to the death of two or more people on the same day, then the shradhs should be performed in the order of their death. However, under no circumstances should the same individual perform shradh for three people on the same day. At the most, two shradhs can be performed on one day. The third shradh should be performed on the next day or someone else should be requested to perform the third shradh on the same day. This shradh ceremony should be performed on the Navami (Ninth day) of the Pitrupaksha by her son or the husband. Death before her husband dies bestows her with the label of ‘avidhva (Not a vidhva [Widow]’). This shradh need not be performed after the death of her husband. In this shradh, a married woman is offered a meal and is gifted clothes and a coconut. A son, while his father is alive, can perform the shradh of his maternal grandfather. This is called Matamaha shradh. However, while the grandfather is alive, the grandmother (maternal) passes away, then he cannot perform this shradh for the grandmother. It can be performed after the annual shradh of the grandfather has been performed, meaning, from the second year after the death of the grandfather. This shradh can be performed on Ashwin Shukla 1 and till the sun is in the zodiac sign of Libra. The age of the son performing the shradh in this case should be over three years. Even if the thread ceremony of the son has not been performed, he is permitted to perform this shradh. After the father of the performer of the shradh dies, till his second anniversary shradh, the shradh for the maternal grandfather is performed separately. Thereafter, there is no need for a separate shradh, since in the shradh performed for the father itself there is a mention of the grandfather. 10 Can shradh ceremony be performed for those whose final rites have not been performed appropriately ? 11. How is shradh ceremony for a renunciant performed ? After performing shradh for a renunciant in a specific way, a samadhi (Last resting place) is built for him. No pinda is offered to a renunciant. A son should perform the Parvana shradh for his renunciant father. The annual shradh should also be performed as usual. Do not perform Ekoddishṭa shradh. Mahalaya shradh should be performed on Dwadashi, instead of on the tithi when he took samadhi. 12. How is shradh for an yati (Ascetic) performed ? Ekoddishṭa shradhs should not be performed for an Ascetic. Only a Parvana shradh should be performed on the eleventh post-death day, because if the Ascetic has taken the vows of command over the body, mind and speech represented by the tridanda, he does not assume the corpse state, but directly becomes a parvana, meaning, an ancestor. 13. What is the science underlying the act of a crow pecking at the pinda ? During the shradh rites, the pitars are invoked by offering a pinda. The unfulfilled desires of the pitars are fulfilled through the pinda. Since an average human being has several desires, his subtle-body releases Raja-Tama-predominant waves, that is, Raja-Tama-predominant waves. Crow is a bird that can attract maximum amount of Raja-Tama-predominant waves; hence, it can perceive such waves. When the subtle-body of the pitars gets attracted to the pinda, it gets charged with Raja-Tama-predominant waves. The crow gets attracted towards these waves. The crow’s pecking at the pinda is an indicator that the pitars were invoked at the venue of the shradh and that they were satisfied with the offering. This process is also known as ‘crow pecking’. Thus, the crow is a medium between the subtle-bodies with unfulfilled desires and human beings. Black sesame seeds are mixed in the pinda so that the crow pecks at it. Sesame seeds increase tiryak waves, meaning, the Raja-predominant waves. The crow gets attracted to these waves. This increases the possibility of a crow pecking at the pinda by 30%. If someone does not promise to fulfill the desire of the subtle-body, then due to the marak (Destroyer) waves emitted by the subtle-body of the pitars, even if the crow comes near the pinda it cannot peck at the pinda. 16. What are the alternatives adopted if the crow does not peck at the pinda ? If despite a long wait the crow does not peck at the pinda and the unfulfilled desire of the deceased individual is not comprehended, apparently it will not be possible to assure that the desire has been fulfilled. Sometimes, the crow does not peck at the pinda for twenty four hours also. Under such circumstances, a crow made from darbha is touched to the pinda. 17. What happens to the Jiva after his death? The spiritual information about the human body: From a spiritual perspective, the human body is made up of five sheaths. The first is Annamaya-kosha, that is, the physical body visible to us. The second is Pranamaya-kosha – it has the five vital energies (Panchaprana) providing energy to the whole body. The third is the Manomaya-kosha – This is the seat of emotions and desires. The fourth is Vidnyanamaya-kosha – This is the seat of the intellect. The fifth is Anandamaya-kosha – This is the seat of the Soul (Atma). The process of an embodied soul (Jiva) getting entangled in his desires after death: After death a Jiva, that is, the subtle body constantly makes efforts for fulfilling its desires. Sometimes it enters another body forcibly. Due to desires a Jiva goes to various subtle regions (lokas) as per his actions. Despite going from one place to another, the Jiva has intense attachment to his previous place. Many a times while going from one place to another, this Jiva goes astray and keeps searching for something. The process of getting entangled in desires after death is known as hurdles in the further progress. Due to this, the responsibility of liberating the person from this process of getting entangled in desires rests with the deceased person’s family members. 'I offer' – mantra recited while offering oblations.